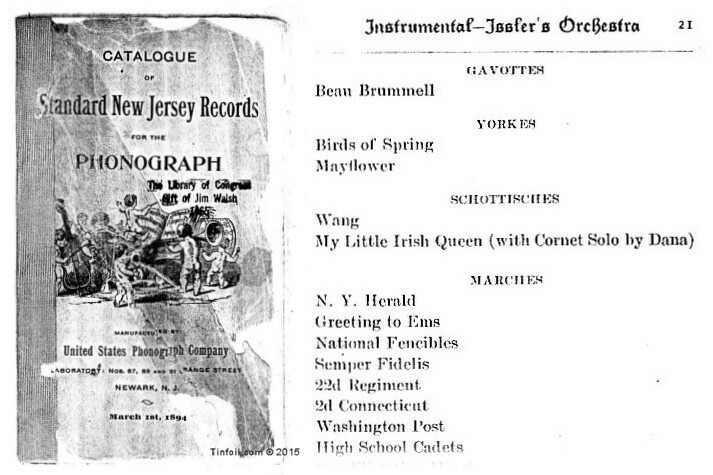 From 1897, Issler's Orchestra plays the snappy schottische, My Little Irish Queen. Announcement "Schottische, My Little Irish Queen, played by Issler's Orchestra." Enjoy this fine recording  although the announcement is a bit hard to hear  by the great and prolific Issler's Orchestra. As with many Issler selections, this tune remained popular and was listed in early phonograph company catalogs for many years. Based on the announcement and cylinder, this recording was made sometime between 1895 and 1897 by the United States Phonograph Company (the successor to the New Jersey Phonograph Company) in Newark, NJ. Issler's Orchestra recordings have been and remain generally my personal favorite grouping of early band sound recordings. 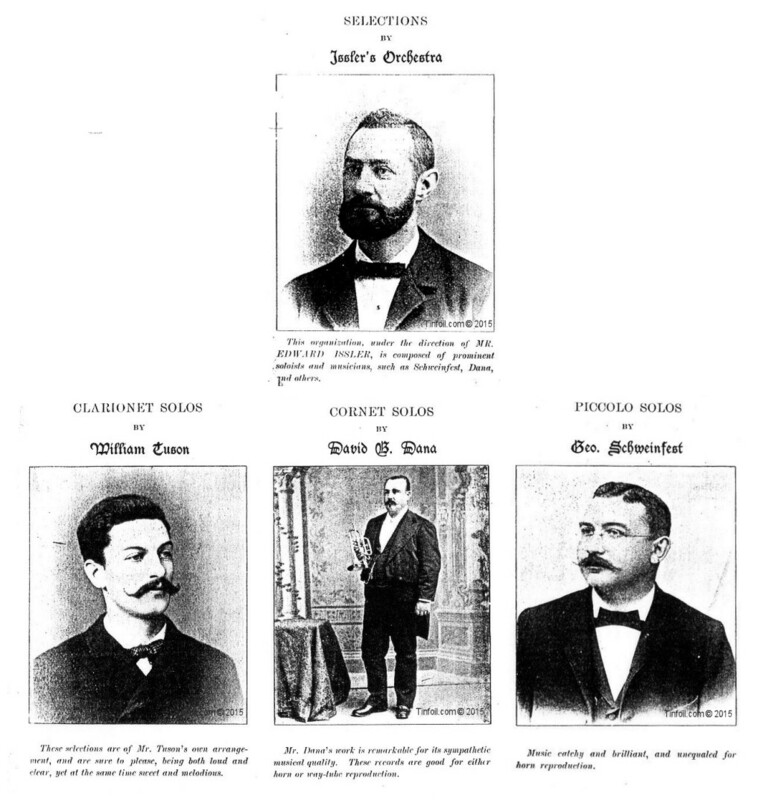 Yes, they did turn out many routine selections, but that is mainly because they were called upon to churn out the lion's share of band records from the late 1880s through late 1890s. However, Edward Issler and his very competent associates (David B. Dana, cornet; George Schweinfest, piccolo; William Tuson, clarinet) often put into their recordings much more than they had to. Going well beyond the musically mundane, they made a noticeable effort to imbue these primitive records with as much musical interest (dynamics, variety, and subtle embellishments) as they could tastefully pack in. Accomplishing this round after round, day after day, with a consistent energy and ethic, seems by today's standards extraordinary  even spectacular. "No musical record by any individual or organization have as large or as general a sale as the cylinders by Issler's Orchestra. Always clear and loud, and very melodious, they please all classes of listeners. Long use does not dim the record, the cylinders being deeply engraved for hard wear. They are loud as band records. Equally suitable for horn or way-tube [ear-tube] service." Although the catalog, above, states "with Cornet Solo by Dana", in this recording it is Schweinfest on the piccolo that gets the most play.